Enhance the look of your outdoor space with these square or rectangular concrete planters elegantly molded to create the look of divided panels. Made of rebar-reinforced precast concrete for durability and strength. 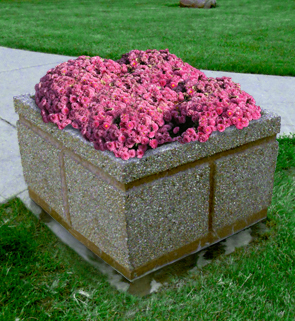 These large planters are strong enough to support even large root systems and their substantial weight naturally discourages theft. Quality and durability for commercial and residential settings. Five drain holes at the bottom provide proper drainage.